Enjoy family vacations in Florida with pristine beaches, great shops and restaurants, and festivals year-round. Buy or rent a timeshare in New Smyrna Beach and you'll be able to plan your Florida vacations easily—and without hitting your budget too hard. Browse the inventory at SellMyTimeshareNow.com and save up to 70% off retail! What’s My New Smyrna Beach Timeshare Worth? New Smyrna Beach is known for its sunny, blue skies and pristine beaches. With a New Smyrna Beach timeshare, you can enjoy this popular Florida vacation destination year after year. 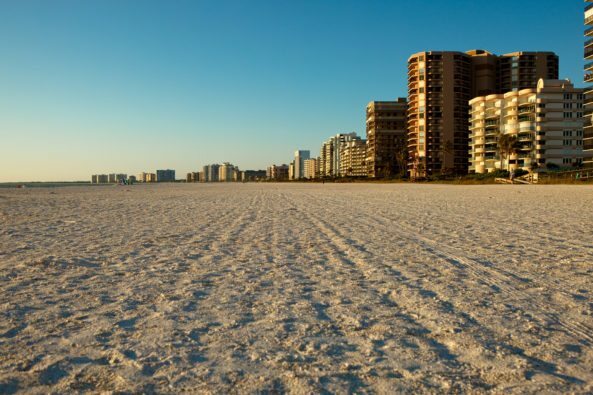 Consistently voted one of the "Best Beaches," New Smyrna boasts over 13 miles of white-sand beaches. This charming town also offers fantastic offshore fishing, golfing, cultural events, and unique shopping and dining experiences, as well as a rich history. You'll find a wide variety of things to do in New Smyrna Beach, from great shopping and dining to family attractions. This Florida location has the feel of a large city while maintaining the charm of a small town. New Smyrna Beach also hosts an array of festivals throughout the year that celebrate art, music, film, food, wine, and more. Buying or renting a New Smyrna Beach timeshare is simple and affordable when you browse the available inventory at SellMyTimeshareNow.com. Here, you'll find affordably priced units without the extra costs resort developers add on. Fill out the form on the right to get started or call us at 1-877-815-4227. New Smyrna Beach Municipal Golf Course – The avid golfer will find plenty of options in New Smyrna Beach. Play a round at the New Smyrna Beach Municipal Golf Course, designed by Donald Ross in 1948 and completely restored in 2006. This course offers challenges to players of all levels. It even features a pro shop and a clubhouse where you can enjoy breakfast and lunch. New Smyrna Beach Sugar Mill Ruins – Explore and get a glimpse of the area's rich history. Built in the early 1800s during Turnbull's colonization, the mill was once highly functional. It was destroyed during the war between the Seminole Indians and the United States, however, as were the sugar plantations and all the buildings in New Smyrna. Boating – Boating in New Smyrna Beach is a local favorite due to the area's many waterways and location on the Atlantic Ocean. Enjoy kayaking, canoeing, paddle boarding, or boating. The local marinas offer rentals, or you can bring your own equipment. Boating is a great way to go fishing or birding, and to spot dolphins and manatees up close. New Smyrna Beach is also home to many sophisticated timeshare resorts. You can find the perfect New Smyrna Beach timeshare for your family for much less than the cost of a pricey hotel. Additionally, timeshare resorts typically feature more spacious units and a better selection of amenities than the average hotel. Are you ready to find your Florida home away from home? We've listed several of the most popular New Smyrna Beach timeshare resorts to get you started. Outdoor enthusiasts will also enjoy scuba diving off the pristine white-sand beaches in New Smyrna Beach. Explore the famous wrecks and stunning reefs of New Smyrna Beach. The area's renowned Sea Dogs Dive Center has over 25 years of experience, and all instructors are PADI certified. If you want to experience the local feel of New Smyrna Beach, dine at Norwood's Restaurant and Wine Shop. This New Smyrna Beach tradition serves fresh seafood and other great fare, and features a Wine Shop with over 30,000 bottles and 1,200 labels. Norwood's is also known for its exemplary staff and pleasant atmosphere. Another local favorite is Clancy's Cantina, which serves fine Mexican cuisine. Clancy's also hosts live entertainment, most notably singer Tommy Brown, along with a variety of other singers and musicians. New Smyrna Beach hosts an astounding number or weekly and annual festivals and events. Some of the most famed include the weekly Farmers Market, New Smyrna Beach Food Festival, New Smyrna Beach Shrimp & Seafood Festival, New Smyrna Beach Jazz Festival, New Smyrna Beach Chowder Festival, and Images: A Festival of the Arts. Boutiques, gift shops, upscale shopping, and much more can be found throughout New Smyrna Beach. Find Premium nam brand apparel for outdoor enthusiasts at the New Smyrna Outfitters, women's fashion at Angels by the Sea, pick out jewelry at Beachsyde Jewelers and Beachy Chic Designs, or find children's gifts at Butterfly Kisses for Kids. You can explore New Smyrna Beach and the entire Volusia County on Votran, the area's public transit system. The bus operates Monday through Saturday and fares are inexpensive. You can also find multiple taxi services in the area. To explore the area more freely, you can rent a vehicle from Enterprise Rent-A-Car or Avis/Budget Rent-A-Car. Three miles away from central New Smyrna Beach, is the New Smyrna Beach Municipal Airport, also known as the Jack Bolt Field. The Daytona Beach International Airport is also under thirty minutes away. Already Own a New Smyrna Beach Timeshare?